Remember the iPhone 3GS? The 2009 smartphone, the third in Apple's iPhone line, is reportedly going back on sale via South Korean retailer SK Telink, after an untouched batch of handsets were discovered in a warehouse. According to ETNews, interested punters will be able to get their hands on the vintage phone for 44,000 won, which works out at around $40/£30/AU$55. 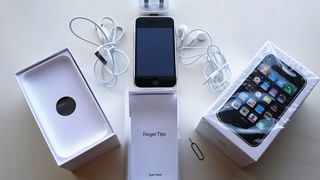 Buyers get all of the original packaging and accessories with their purchase – the phones are being sold in the same state as they were nine years ago. The retailer is apparently going to check that the batteries work on each of them before selling them though. At the moment we don't know how many phones we're talking about, but they're likely to be in high demand. Before you rush over to South Korea to grab your own piece of tech history, note that you won't be able to run anything past iOS 6 on these devices. That means no AirDrop, no Control Center, and no automatic app updates. Under the hood you're looking at a 600MHz Samsung S5PC100 processor, a whopping 256MB of RAM, and 8/16/32GB of internal memory. The front display measures just 3.5 inches corner to corner, and there's no front-facing camera, so selfies are going to be tricky. The smartphone was quite a different beast in 2009. You can of course still find the odd iPhone 3GS available for sale, but it's unusual to be able to pick up a factory fresh one at such a low price. Just don't expect Apple to take care of any repairs for you.